Henderson Eels players celebrate a goal in their win over Lautoka FC at churchill Park. Photo: Avikash Chand. 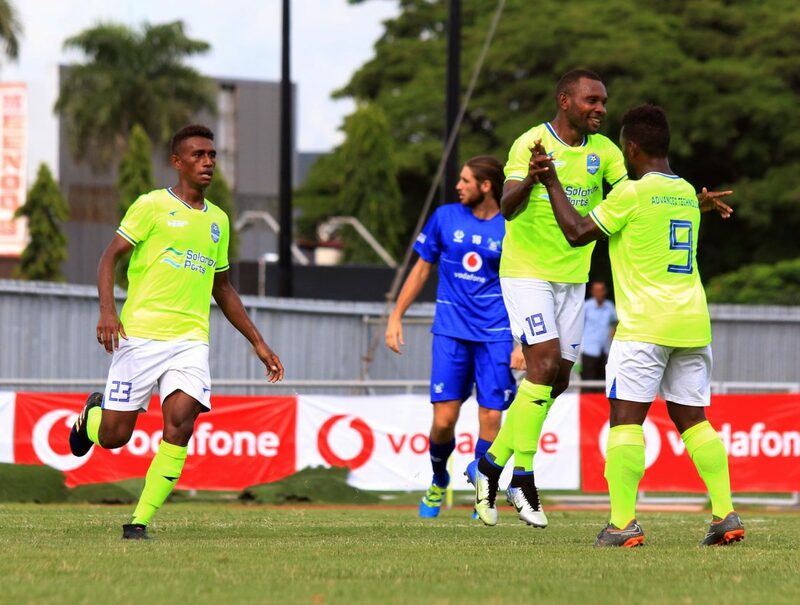 It is a three horse race in Group B of the 2019 OFC Champions League as AS Central, Lautoka FC and Henderson Eels are still in pole positions for the quarter-finals heading into final match day on Saturday. AS Central Sport convincingly beat FC Morobe Wawens 7-0 to put one foot into the quarter-finals and Henderson Eels upset Lautoka FC 6-5 with a great game of football to keep their last eight hopes alive. FC Morobe Wawens started the encounter at Churchill Park with some encouraging signs going forward as they created a number of early scoring opportunities. The Papua New Guineans were punished 7th minute into the game as Sylvain Graglia finishes off a well-crafted team move to put AS Central Sport in front. Graglia competed his hat-trick with two more goals in the first half alongside goals from Lorenzo Tehau and captain Fred Tissot to give AS Central a 5-0 lead at the break. Tahiti international Tehau scored his brace in the 58th minute and Graglia competes the rout with his sixth OFC Champions League goal this season. The win means AS Central Sport is leading Group B with six points and FC Morobe Wawens will play for pride when they take on fellow Melanesian wantoks Henderson Eels on Saturday. AS Central Sport coach Efrain Araneda was pleased with the win thou he highlighted they have a slow start to the game. “Happy, very happy with the result, now we waiting on the next game,” he said. FC Morobe coach Peter Purari rued his boys’ missed opportunities in the opening exchanges. “We should have scored in the first 10-20 minutes but lack of concentration we didn’t finish our opportunities well very,” he said. Later in the day, a spirited performance from Henderson Eels saw the newcomers produced a major upset to beat Lautoka FC 6-5 to keep their hopes alive ahead of the final group fixtures. Henderson Eels started the Melanesian derby on the front foot with intentions to play on the counter. The Solomon Islanders persistent paid off in the 5th minute as Hudson Felani’s low drive outside the box caught Lautoka keeper Beniamino Mateinqara off guard. The hosts regrouped to put pressure on the visitors defense and their commitment was rewarded when Vanuatu international Bong Kalo draw level in the 24th minute with a close range finish. Four minutes later, Daniel Allan turns a corner kick into his own net to put Henderson Eels back in front. Young forward, 19-year-old Raynick Laeta scored his second goal on his second appearances in the competition to extend the visitors lead. Fiji veteran Osea Vakatalesau pulled a goal back in the 43rd minute and an own goal from Desmond Tutu reduced the scoreline to 4-3 in favour of Henderson Eels as both teams went back into the sheds. The comeback was completed in the 59th minute as Samuela Drudru put the hosts back on level terms and Kolinio Sivoki smashed a free-kick past Tutu to give the host a 5-4 lead. The hosts were holding on to make sure of victory but the Solomon Islanders had other ideas to produce a thrill in dying embers of the match. Substitute Clement Baegeni deft header in the 90th minute flew past Beniamino to turn the game back on its head. Talisman Joses Nawo scored the match winner in the 4th minute of five additional time to earn a crucial three points for Henderson Eels. Henderson Eels coach Eddie Marahare was full of pride for his country after a decisive win. “I think first of all as a Christian country I just want to dedicate the win to the almighty,” he said. “It’s a good comeback for us especially we lost in the first game and I am really happy about the win today. Lautoka coach Kamal Swamy said lapse of concentration in the later stage of the game cost them outcome of the result. “I think we were lethargic in the last 20 minutes that’s why we gave them two goals,” he said. After match day two, Henderson Eels are now equal on 3 points with Lautoka heading into the final Group B matches on Saturday. Henderson Eels will take on FC Morobe Wawens at Churchill Park in the day’s early kick off while Lautoka FC and AS Central Sport will round up Group B with a do-or-die clash for the hosts at 4pm.